Lattice structure tensile specimen manufactured with laser melting (LM) process out of the material H13. For the first time since the existence of the Direct Manufacturing Research Center (DMRC), all DMRC members met with one of the industrial partners outside Paderborn. Host was from 18.09. until 20.09. in Celle the company Baker & Hughes. As part of the FOCUS project, the partners discussed the future strategic direction of the DMRC and developed guidelines, strategic goals and immediate tasks to implement the strategy. On Wednesday, results of DMRC projects and publicly funded projects were presented as part of a technical workshop. With two startups - AMendate and AMproved - two companies presented their innovations, which were founded by young scientists of the DMRC and solidify the success of the DMRC in the industrial environment. 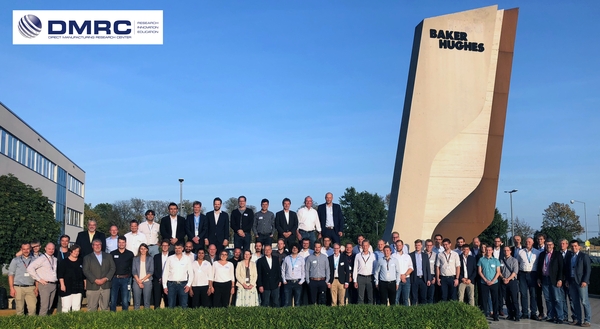 Hosts Baker & Hughes presented the guests with an impressive tour of the factory as DMRC results are incorporated into products and services for the oil drilling industry. On Thursday, as part of the board meeting, the research direction was agreed and topics of research projects for 2019 agreed. Finally, the reorientation of the DMRC strategy was confirmed and subsequent steps determined. Emotional conclusion of the successful meeting: Randy A. Southmayd, longtime Chairman of the Board of Directors, has been adopted. He hands over the leadership of the Industry Board in the DMRC to Scott Martin (also The Boeing Company). The DMRC thanks the company Baker & Hughes for the hospitality and excellent organization of the meeting!